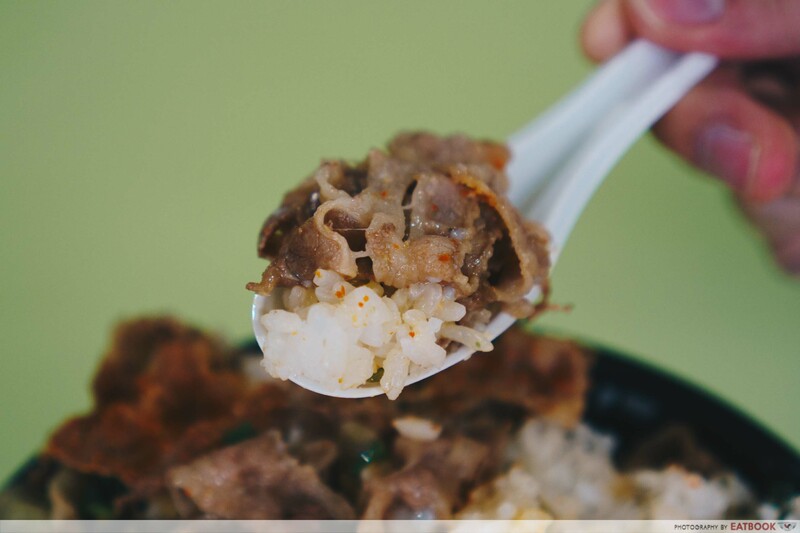 A steaming mass of rice topped with copious amounts of meat, there’s a reason why thousands of these quick and comforting bowls area lunchtime favourite for office workers in Japan. 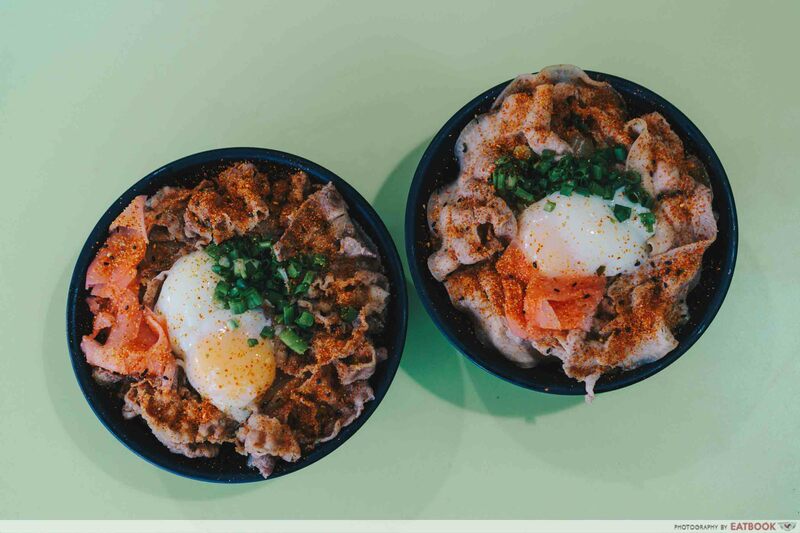 Inspired by their travels and stints as office workers, the owners of Kinobe aim to cater to Singapore’s CBD office crowd with cheap and nourishing donburi. Nothing fancy – just simple food done well. Appearance-wise, the Gyudon ($6) made a big first impression. 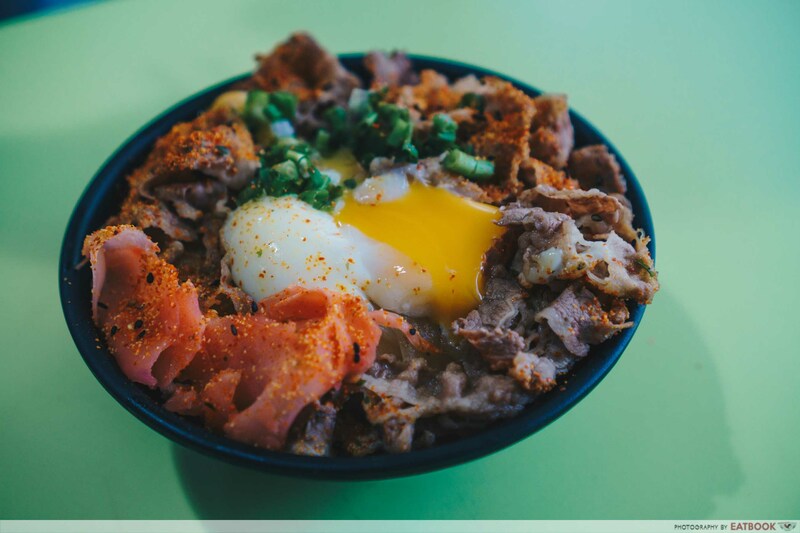 The sizable bowl was piled high with rice and completely topped with strips of well-marinated premium American beef, stewed onion slivers, and a jiggly onsen egg. Spring onions, chilli flakes and pickled ginger provided a splash of colour to the bowl. 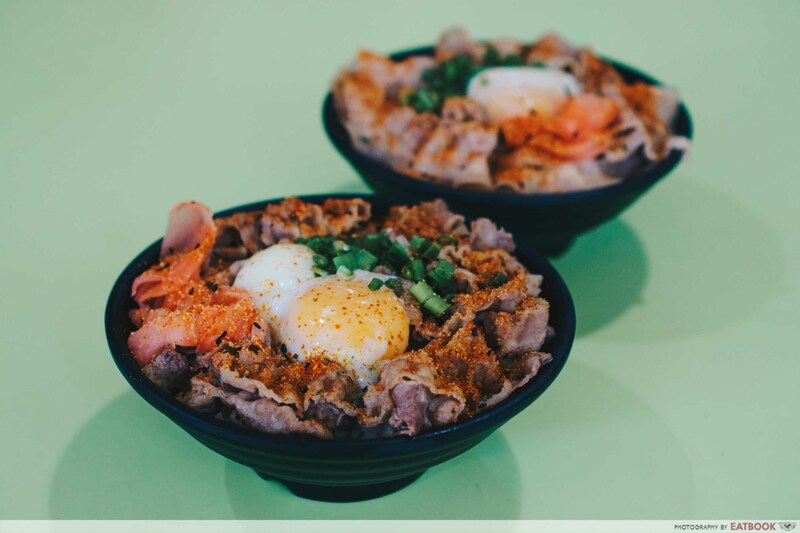 One bowl will satisfy even the most ravenous of bellies and is definitely worth the price tag. Swooping for the beef first, it had tender meat and melting layers of fat. We were glad it did not have an off-putting, stringy texture. It was well-balanced in terms of taste, with sweet and soy sauce flavours from a sukiyaki-style marinade complementing the beef’s natural flavour. A hit of slightly citrusy spice from the shichi-mi tōgarashi – a type of Japanese spice – appeared last, providing added vibrancy. However, we wished the meat-to-rice ratio was a bit better, as we still had a mound of rice left once we finished the meat. That said, for $6, the portion was already more than generous. More than just an aesthetic gimmick, the onsen egg was a crucial component here. It provided much-needed moisture to the rice and binded all the ingredients together, creating a more cohesive dish. Once mixed, it also imparted a rich and creamy coating to the beef. However, we felt that more of the meat’s marinating sauce should have been added, as the grains at the bottom of the bowl were dry and bland. In addition, the stewed onions were overcooked and were too limp to provide a necessary crunchy counterpoint for the dish. 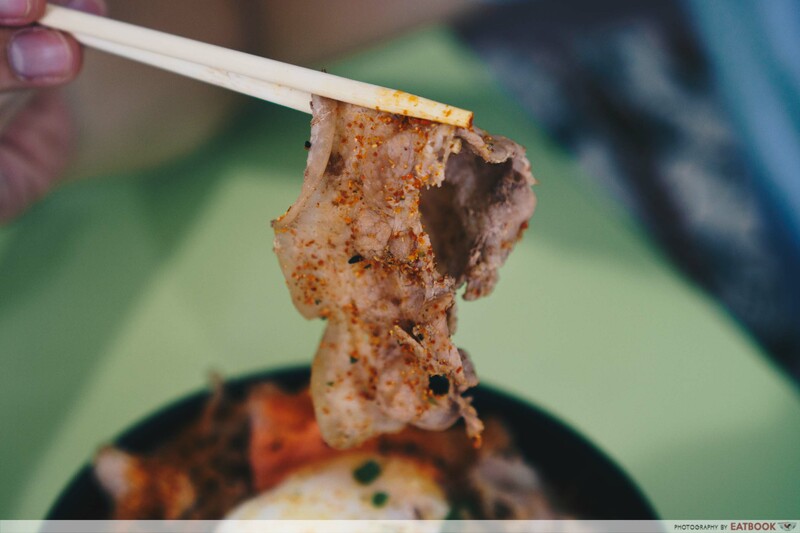 The “buta” in Butadon ($5) conventionally comes in two forms, with lean char-grilled loin being more common. This stall, however, goes down the other route, using fattier strips prepared similarly to their beef. The pork came in long, thick strips and was well-marbled. While it was cooked properly, it was less tender than the beef, with more chewy fat. Compared with the robust beef, its subtle flavour didn’t stand up to the marinade as ably. 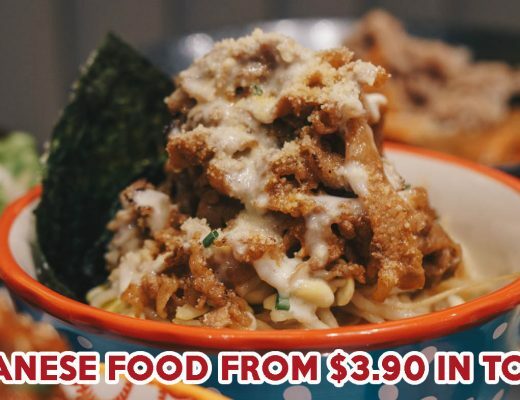 As a beef lover, I’d certainly stump up an extra dollar for the gyudon. 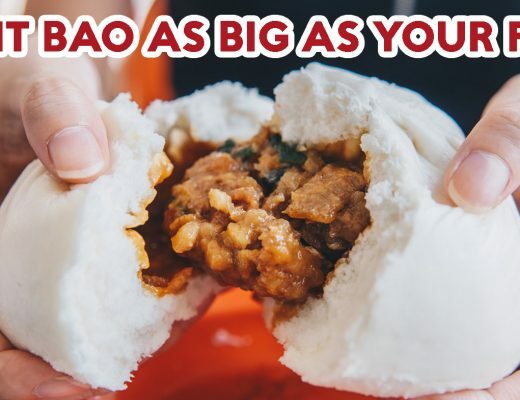 Based in the bustling Amoy Street Food Centre, a prominent lunch haunt for CBD office workers, expect to have trouble finding a seat if you come past 12:15pm. 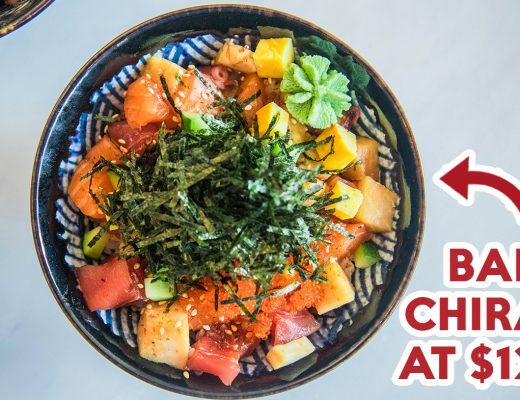 Kinobe opens from 10am though, so take your lunch break a little earlier if possible to snag a seat. Walking towards Kinobe, don’t be put off if you see a tremendously long queue. 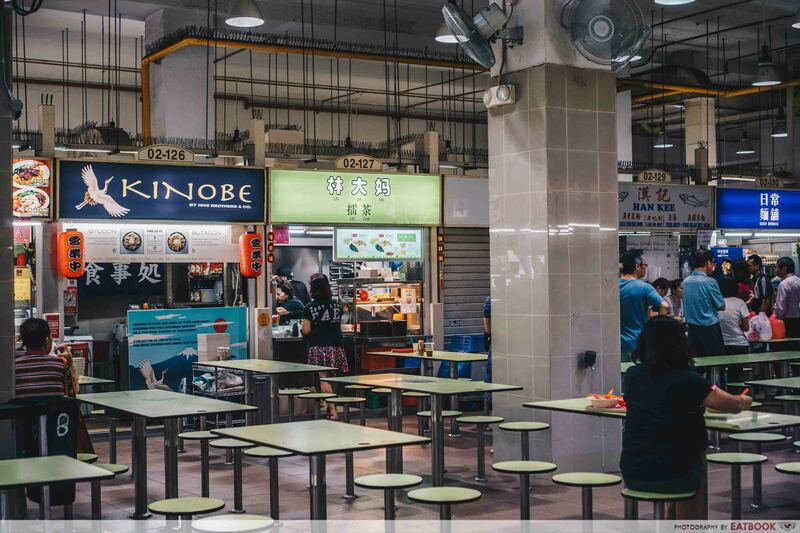 It’s caused by Kinobe’s near neighbour, Han Kee Fish Soup, one of Amoy’s most renowned stalls. 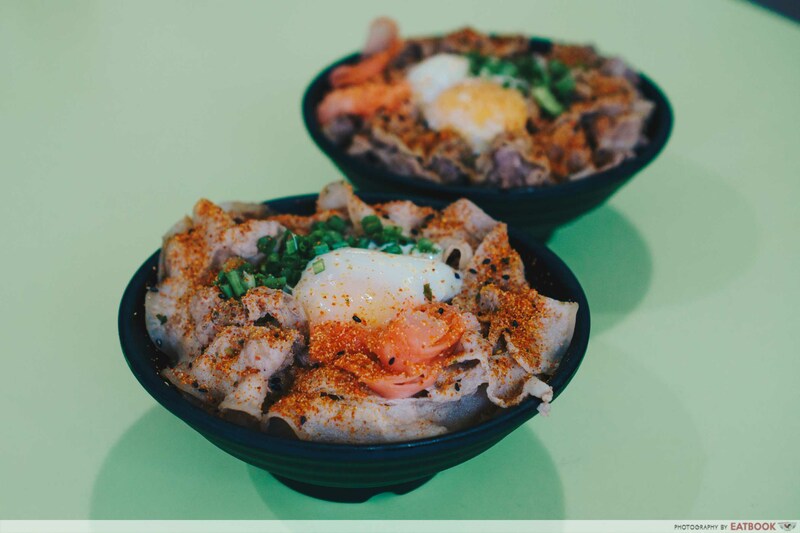 If you feel like injecting some Japanese flair into your lunchtime, Kinobe is a safe and affordable bet to fill you up. Nothing here will blow your socks off, but it delivers exactly what it promises: simple, affordable and soul-warming food that’s perfect for an office worker’s lunch. 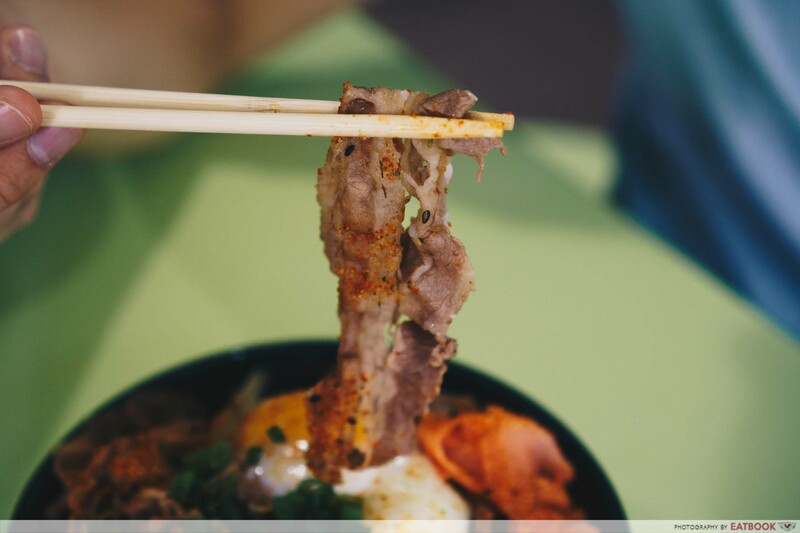 Amoy Street is home to an abundance of food options. 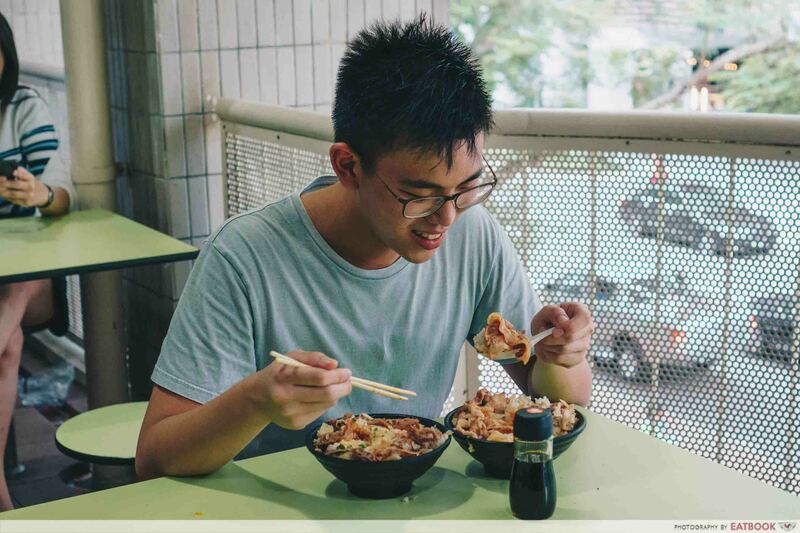 Check out our guide to Amoy Street Food Centre and our review of Dumpling Darlings for more options in the area! 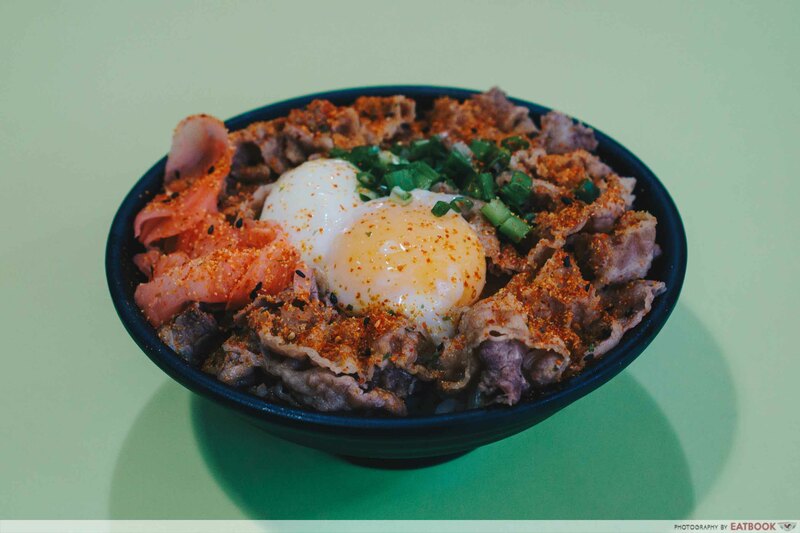 For a more atas gyudon experience, check out Beef Sukiyaki Don Keisuke. Photos taken by Becky Chong and Leong Kit Shan.